IEC Metric Socket Toggle Pads feature metric threads and an exclusive ball design that minimizes base separation. Ideal for heavy-duty load requirements. 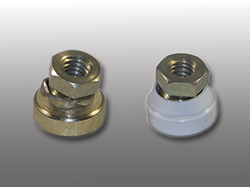 Integrated ball and swivel socket provides a low-friction support interface. Perfect for cabinets, instruments, machinery and equipment.